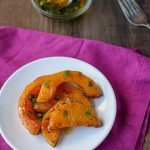 Featuring a sweet, savory and tangy flavor, this Roasted Butternut Squash recipe is sure to quickly become a favorite side dish! I just love the combinations of flavors in this Oven Roasted Butternut Squash. The smokiness of the chipotle mixed with the sweetness of the butternut squash is just SO good! And the added sweet and tangy flavor of the chipotle lime dressing on top just takes it to the next level. Seriously, so good. This recipe is one that I’ve slightly adapted from America’s Test Kitchen The Best Mexican Recipes cookbook. They used a tiny bit of canned chipotles in adobo for their recipe, but I haven’t been able to find a brand whose ingredients I like. So, I chose to go with chipotle chili powder. I used a brand of chipotle chili powder called Madrecita that I used to be able to find at Sprouts. Not all Sprouts stores carry it though, and I’ve had a tough time finding their spices lately. I know that McCormick also sells one. 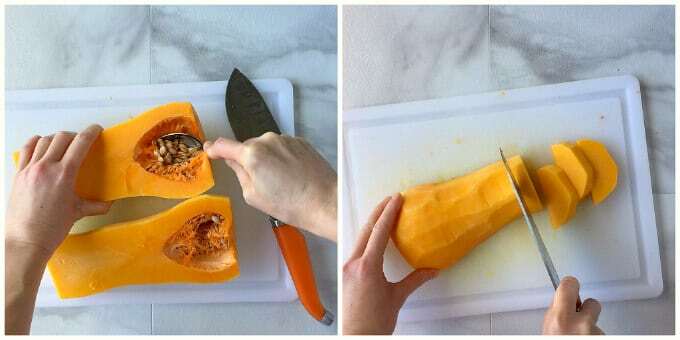 Begin by slicing the ends off of the squash. Use a sharp vegetable peeler to peel away the outer skin, any white or light-colored flesh, and green lines. You want to get down to the bright orange flesh of the butternut squash. Cut the squash lengthwise down the middle and use a spoon to scrape out all of the seeds. Lay the squash cut side down on the cutting board and cut crosswise into 1/2-inch slices. It does take a bit of time to roast the butternut squash, but it’s so worth it! It literally melts in your mouth. 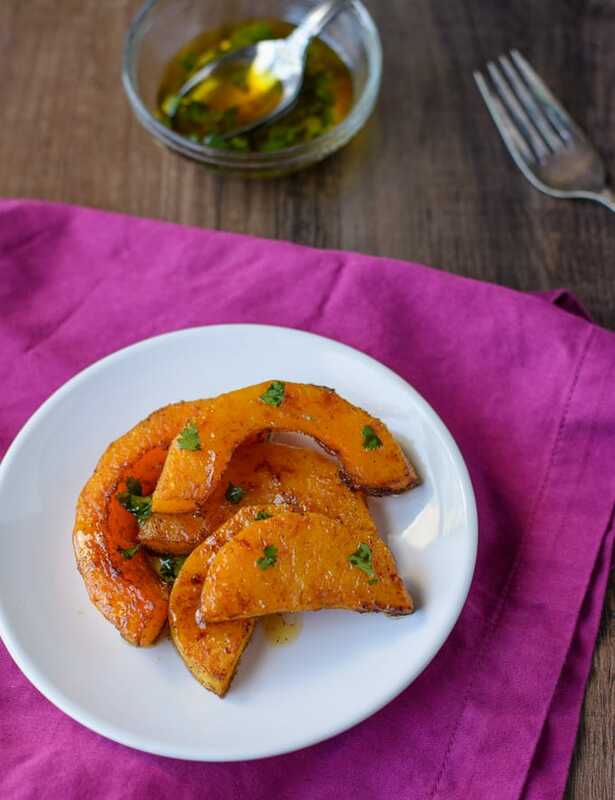 Featuring sweet, savory and tangy flavors, this Oven Roasted Butternut Squash with Chipotle and Lime makes a tasty side dish! Place an oven rack to the lowest position in the oven. Preheat oven to 425°F. 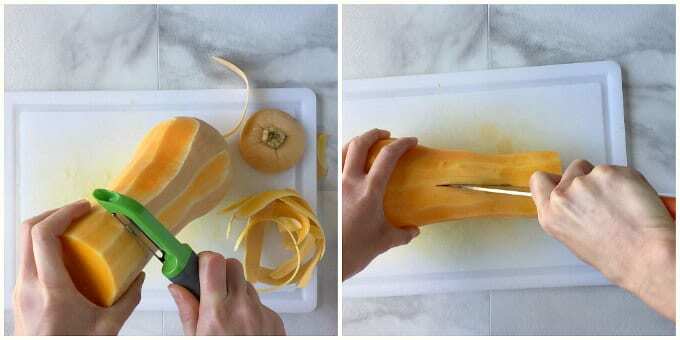 Use a vegetable peeler to peel the squash down to the bright orange flesh. Make sure no white, light-colored flesh or green lines remain. Cut the squash lengthwise down the middle and use a spoon to scrape out all of the seeds. Lay the squash cut side down on the cutting board and cut crosswise into 1/2-inch slices. In a large bowl, mix together the melted ghee (or butter), cumin and chipotle chili powder and sea salt. Add the squash and toss to coat. Place a sheet of parchment paper on a large rimmed baking sheet, then spread the squash out into an even layer. Roast until the bottoms of the squash closest to the back of the oven are well browned, 25 to 30 minutes. 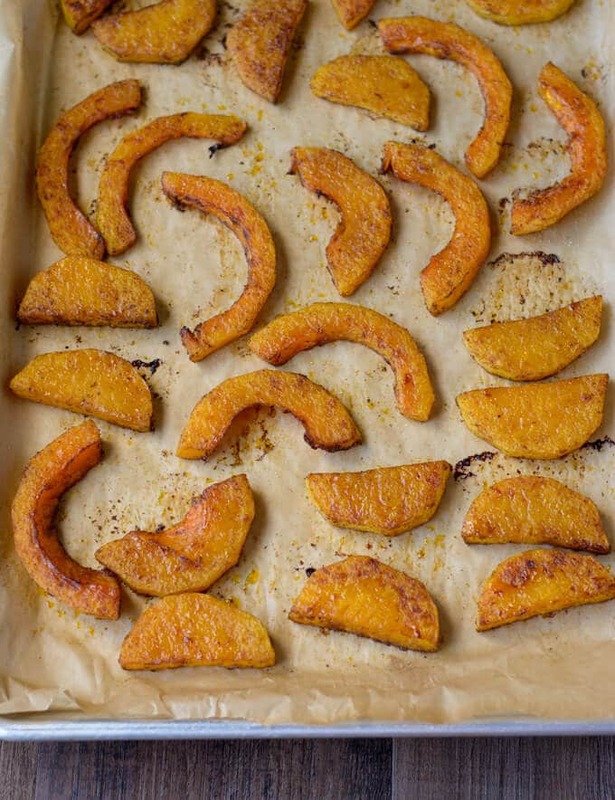 Rotate the baking sheet and continue baking until the bottoms of the squash closest to the back of the oven are well browned, 6 to 10 minutes. Remove the baking sheet from the oven and use a spatula to flip the squash. Place back into the oven and continue to roast until the squash is very tender and bottoms are browned, 10-15 minutes more. Towards the end of roasting time, make the vinaigrette. Whisk together the olive oil, lime juice, honey, chipotle chili powder and salt to taste. Place squash onto a serving platter and drizzle the vinaigrette over the top and serve. Or serve the vinaigrette on the side and allow each person to choose how much they want. Recipe slightly adapted from America's Test Kitchen: The Best Mexican Recipes cookbook.